…in the right corner we have a T-T-T-Tree proudly presented by The Elder Scrolls: Oblivion and in the left corner we have a P-P-P-Palm brought to us by Enemy Territory: Quake Wars! Aaaaand today every seat costs the same because the fighters look (almost) the same from near or far without performance loss! Isn’t that awesome? Let me answer this for you: It is! 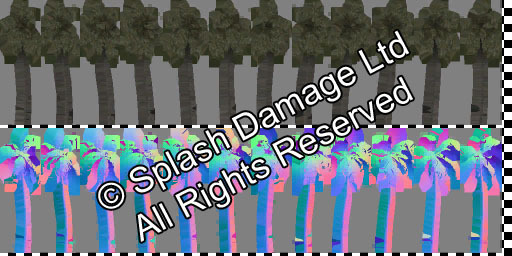 But how is it possible to show a lot palms and trees without performance loss? Is it magic? Is it a wonder? Let’s have a look and find out together! Both, palm and tree, look detailed from near distance! In far distance both get exchanged by a simple billboard! Enemy Territory has the great “set r_skipdiffuse 1” command which let you deactivate the diffuse texture to see the black geometry. In Oblivion on the other hand you can turn the “Tree Fade” slider to “0” which makes you see only billboard trees. Both options are great to visualize the difference between detail and billboard. This make it possible to show a lot of them in a scene but to be honest, Ladies and Gentlemen, we saw something likes this pretty often, didn’t we? 1 Point for both anyway. The answer is: YES! Both blend between detailled and billboarded versions with the famous “Grainy Blend” (known from assassins creed lod blending). And both do it like a boss! If you look carefully you’ll see that they first blend in the detail geometry and then fade out the sprite while you approach them. to see a 50% transparent tree/palm when geometry and sprite are both fade in/out and “meet” at 50% fading progress. There’s a light *plop* on the left side but this nice careful timing of the fading gets a shiny point for both of them! Depending on the viewing angle they change the used part of the texture! Nice trick! The tree in the other corner looks a bit sad and always the same from any angle. I would say we’ve a clear winner here! The P-P-P-Palm!!! But what is that? The tree doesn’t give up and strikes out to crush the palm with his super-power: Variation! Thanks Mueckenmann for sharing this wonderful article about the creation of imposters for trees. Oh and it also contains the correct name for the “famous” fading: stippling! Just found this nice little insight into Uncharted 4 Imposter creation since it looks similar to what Enemy Territory did. Click here to see the complete talk. This entry was posted in Game Art Tricks and tagged Enemy Territory, Oblivion, Quake Wars, The Elder Scrolls on 15. November 2013 by Simon. Could have been way better if the scores corresponded with the trees on the right side. Palm on the left in the pics but on the right in the scoring? Beyond confusing! Overgrowth, the upcoming indie game of Wolfire, also make a great use of impostors. They have a detailed article about them, and all the visual trickery they use !